Welcome to Mr. Chris’s Classroom! Hi, my name is Mr. Chris Kruger, and I am thrilled to be at Plato Academy. 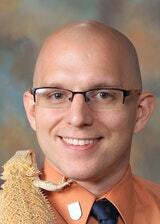 I love learning about space, science fiction stories, and bearded dragons, like our classroom pet, Godzilla. I grew up in central Wisconsin and moved to Chicago for graduate school. I received my Bachelor’s Degree from the University of Wisconsin in philosophy, my Master’s Degree in Humanities from the University of Chicago, and my Master’s Degree in Teaching from National Louis University. I believe the purpose of education is to create whole people, citizens of the world ready to gather their own information and come to their own conclusions. I look forward to learning and growing together! Follow along with us at our blog! Great News! I was selected by Math at Home as their blogger of the month for April 2018. In my guest blogs, I talk about the groundwork I did to prepare for our exploration of graphing. Check out the blog at http://mathathome.org/blog/.